Time to let go, move on…and give out some prizes! So my Magic Fun Week Celebration is drawing to a close, and I’m waxing a little nostalgic. It seems like just the other day I gave you a list of some surprising Houdini facts. And remember the time I listed the five female escape magicians who were a little like Lady Lydia? Sigh. How does time fly so fast? Why it might have just been yesterday that we were talking about the greatest escape magic tricks! You are within a mile of an aspiring writer right now. No joke. There are a lot of us. And by aspiring, I mean a writer who hopes to one day have a bestseller on the shelves. Maybe they’re in the process of writing their first one, maybe they’ve got seven books already floating around out there in the ether. Maybe they have yet to put pen to paper (sounds better than fingertips to keyboard), but they do plan to one day write a book. My point is, there are a lot of people out there writing books, and some of us are even publishing them. Readers have a lot to choose from, and they’re going to choose a book with twenty to a hundred favorable reviews over a book that has just one. So how do these aspiring writers obtain those reviews? No clue. But I’m not too proud to beg. Please, please, please if you’ve read and enjoyed one of my books, leave me a review on Amazon! It might just help the next reader decide if she wants to take a chance on me or go back to her favorite best-selling author. I don’t actually have a chicken dinner to award anyone, but I do have some pretty cool stuff. Without further ado, here are our winners and what they won. Winners! Richard, Scotch & Soda; Cheryl Rhodes, Linking Rings; C.J. May, Love Me deck; John Hinson, Archangel deck; Sherry Thompson, Escape Magic; Sal, Escape Magic. Thanks to everyone who participated, and also everyone who has given Escape Magic a warm welcome into the world. Escape Magic will remain a cool 99 cents for Kindle, but the special 99 cent price for Close Up Magic for Kindle will expire on Monday. So if you haven’t gotten your copy of Book 1 of my Sleight of Hand series, do it now! 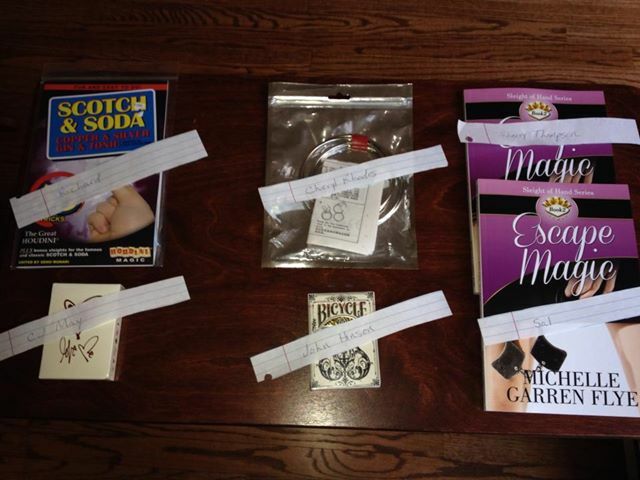 This entry was posted in Close Up Magic, Escape Magic, Sleight of Hand and tagged Close Up Magic, Escape Magic, giveaway, magic, romance, Sleight of Hand, winners by michellegflye. Bookmark the permalink. Cool. I think I won a prize but I don’t remember entering a contest. You did win! Chinese linking rings, which is one of my favorite magic tricks. Email me an address to mail it to michellegflye at gmail dot com and I’ll get it out to you next week!